Traditionally to become a member of the Lions Club, you have to be asked to join by a member of the Lions Club. So if you are intrested in becoming a member, the best way to do this is by attending our meetings and volunteering in any of our many projects that we are involved with. 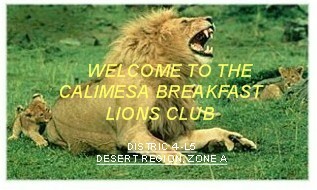 The Calimesa Breakfast Lions Club is a very active club, and we welcome anyone who would like to volunter their time to those in need.